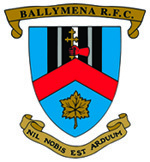 BALLYMENA: Bruce Houston; Jordan Foster, Darrell Montgomery, Glenn Baillie, Dean Reynolds; Tim Small, Michael Stronge; Nacho Cladera Crespo, Jonny Spence, Chris Cundell, JJ McKee, David Whann, Connor Smyth, Marcus Rea (capt), Stephen Mulholland. Replacements: Andrew Ferguson, Josh Bill, Willie McKay, Alan Smith, Jonny McMullan. CITY OF ARMAGH: Tim McNiece; Andrew Willis, Chris Colvin (capt), Jonny Pollock, Ryan Purvis; Cormac Fox, Harry Doyle; Daryl Morton, Andrew Smyth, Phillip Fletcher, Josh McKinley, Peter Starrett, Nigel Simpson, James Hanna, Robbie Whitten. Replacements: Michael Hoey, Jonny Morton, Gareth McNiece, Chris Cousens, Shea O’Brien.